Advanced tread compounding provides this Eco Plus version with 33% less rolling resistance than the original HDL2 DL. 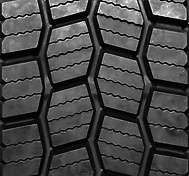 32/32” tread depth provides high mileage and low cost per mile. Patented innovative groove technology leads to minimal stone retention, extending casing life. Minimized wear and excellent traction over the life of the tire, through a wide, closed shoulder tread and numerous tread blocks with multiple grip edges. Built on the Conti 3G casing for maximum retreadability. Long haul, over the road drive position.